Lomé is the capital and largest city of Togo. Lomé was founded by the Ewe, an indigenous ethnic group, in 1880. Located on the southwestern Atlantic coast of Togo, Lomé has a long history of trade. In 2000, an estimated 900,000 people resided in Lomé. Europe’s “Scramble for Africa” began in 1880. During this period, European powers established colonies throughout the entire African continent. Germany gained a foothold in Togo in 1884, on the eve of the Partition of Africa, and established Lomé as the colonial capital in 1897. Following construction of the dock and a railway network, Lomé emerged as a port that attracted merchants from other areas along the coast. The railroad connected Lomé to the interior region of Togo. The expansion of infrastructure coincided with the emergence of a wealthy merchant class that mostly consisted of African women in Lomé. During World War I, France and Great Britain invaded Togo in 1914, conquering the entire country within a month of invasion. In 1919, following the end of World War I, both countries agreed to partition Togo. Lomé fell under French control and became the capital of French Togo. The French developed the infrastructure including a water supply, electrical grid, and expanded railroad. The imposition of a city tax led to violent demonstrations against the French military in 1933. The population of Lomé grew rapidly after World War II, reaching 85,000 by 1960. During this period, the French exploited Togo’s rich phosphate resources. The phosphate industry grew in importance as Togo achieved full independence on April 27, 1960. The Phosphate exports continued to propel population growth in the city. By 1981 the population reached 375,000. 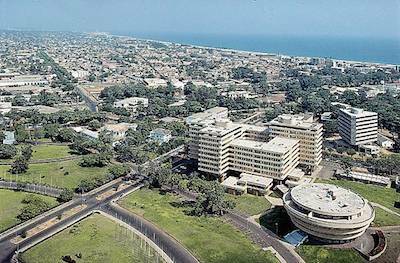 Profits from the phosphate trade financed the construction of Lomé’s modern port, the University of Lomé, hotels and office buildings. Sylvanus Olympio, the first president of independent Togo, was a member of Lomé’s elite merchant class. However, Olympio’s economic policies drew opposition within Togo. For example, Olympio’s decision to close the border with Ghana provoked strong opposition from the affluent market women of Lomé. By 1963, Olympio was an unpopular president and overthrown in a military coup. General Gnassingbe Eyadema became Togo’s president in 1967. Initially, Eyadema enjoyed widespread support partly because of the continued prosperity of Lomé’s wealthy merchant class. By the early 1970s, Eyadema’s popularity declined as he modeled his administration on the repressive government of Zaire’s President Mobuto Sese Seko. By the late 1970s, Togo was a one-party state and phosphate revenues had declined. Eyadema’s austerity programs and repression caused widespread dissension in Lomé. In 1994, the military killed twelve citizens in Lomé amidst unrest. As dissention continued, Eyadema’s political party, the Rassemblement du Peuple Togolais (RPT), and opposition leaders drafted the Lomé Framework Agreement in 1999. The Agreement called for Eyadema to step down as president in 2003. Eyadema defied the agreement, remained in office, and held a celebratory parade in Lomé in 2004. In 2005 Eyadema died in office after having been in power 38 years. Faure Gnassingbe, Eyadema’s son, assumed the presidential office in 2005. Bureau Centrale Du Recensement, “Republique Togolaise,” Resultats Provisoires, February 2011; Mark O’Malley, “Eyadema, Gnassingbe,” “Lomé, Togo,” “Togo,” Africana: The Encyclopedia of the African and African American Experience, editors Kwame Anthony Appiah and Henry Louis Gates, Jr. (New York: Oxford University Press, 2005). Jr. (New York: Oxford University Press, 2005).